1 x 256GB SDXC card with SD Adapter. Optimal speed and performance for SDXC compatible devices. Class 10 speed (based on SD 2.00 specification). FREE SD Adapter is included. Holds countless amounts of data, music, video, images etc. Storage temperature : -20°C-85°C. Working temperature : 0-70°C. Answer - The reading speed will vary depending on the speed of each country's network speed. Size : About 15 × 11 × 1mm. Answer - capacity is real. 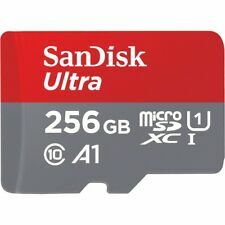 256GB microSD SDXC Flash TF Memory Card Class 10 Micro SD Free SD Adapter. Condition is New. Shipped with USPS First Class Package.